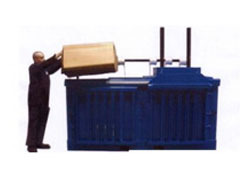 Our balers can be used to compact and separate paper, cardboard and plastic waste. The baler will create neat separate bales of waste which are easier to recycle, saving your business money. What Are The Benefits of Balers? Not only do balers help you to be more environmentally-friendly by reducing bulk and aiding recycling, they also offer the opportunity to make money for your business when you sell your waste to recycling companies. Cardboard is currently fetching record prices so you could create a substantial additional income stream through buying or renting a baler. Our balers come in a range of different sizes with various different features. Whether you are looking to rent a baler for producing small bales infrequently or to buy a baler to produce large bales of up to a tonne in weight, we will ensure that we provide you with the most suitable and cost-effective solution for your business. Please view our vertical balers and horizontal balers, each of which offer different features for your specific baling needs. The key difference between our baling equipment is that horizontal balers are most suited to large volumes of waste, whilst vertical balers produce smaller bales and are the typical choice for those wishing to cut costs and save space. For more information, call us on 01708 550641 to speak to one of our experts.